You will be hard pressed to find a better provider of leather armor then Dark Knight Armoury on the World Wide Web. 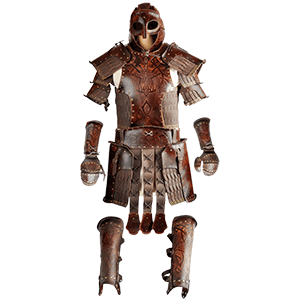 We offer an impressive and varied selection of leather armor, ranging from costume pieces that are slick and stylish to wear to fully functional suits of leather armor that will keep you safe when you are battling and reenacting. There is no muss and no fuss about this section, so let us just get down to brass tacks. Our leather armor is crafted from a variety of different leathers, although the two most commonly used weights are 7-8 ounce leather and 13-15 ounce leather. Our 7-8 ounce leather is lighter and thinner, making it perfect for use for LARP battles, as well as a great choice to wear for theatrical battles or movie productions. By comparison, the 13-15 ounce leather is armor grade leather and will keep you perfectly protected when you wear it, making it great for reenactments and more realistic combat experiences. We offer various styles of leather armor to suit a variety of needs, ranging from full suits of armor that are perfectly protective to individual pieces, ranging from leather armor more like bracers and pauldrons to leather leg armor like greaves and tassets. And of course, we also offer a selection of leather harnesses and cuirasses, as well as leather helmets, to keep your core, torso, and head safe and stylish. We are also proud to say that many of our pieces of leather armor are made right here in the USA, in our own workshop! 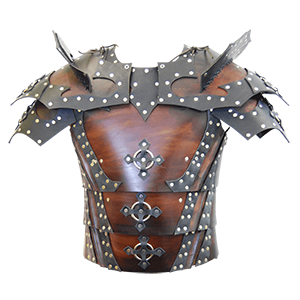 So if you are looking for leather armor, be it Roman leather armor, fantasy leather armor, medieval leather armor, or anything in-between, then you have come to the right place, because Dark Knight Armoury aims to please, both in terms of quality and price. Also, our leather smiths are always hard at work on new designs, so make sure you check back frequently to see what new pieces of armor we are producing next! The arms are very important in battle. After all, losing one or having one disabled could all but ruin you in a fight. That is why keeping them protected yet mobile is important, and nothing strikes a perfect balance between lightness, mobility, and protection like the various pieces of leather arm armor offered here Dark Knight Armoury. Here, you will find leather arm armor that will provide you with total arm protection, ranging from your shoulder down to the very tips of your fingers. Of course, what you wear should be based entirely around what you are doing. Our leather arm armor comes primarily in two grades, either 13-15 oz leather or 7-8 oz leather with some variations that fall in-between. 13-15 oz leather is armor grade leather, while 7-8 oz leather is thinner and more suited for LARPing events or theatrical wear. If you are looking for a little bit of arm protection or just want a good arm accessory, then you have come to the right place, because we offer many different styles of arm bracers. Want something a little more protective? Try a pair of leather gauntlets, which protects not only part of the forearm, but also the hand and wrist. Going for broke? Want the maximum protection possible? Browse our leather full arm armor to layer leather protections across your whole arm. And if you want something that helps you stand out while providing good protection, you will definitely want to check out our leather pauldrons and spaulders. As you can see, there is a lot of leather armor here at Dark Knight Armoury. If you know what you want, then click away and go right to what you need. But if not, then we wish you happy hunting as you locate that exact piece of leather arm armor that you desire. Armoring your legs before you head into battle is a very important thing. Why, you might ask? Because nothing will stop a warrior faster than when they have their legs cut right out from under them. That is why Dark Knight Armoury offers a wide selection of leather leg armor, to help keep any warriors legs properly protected, as well as nicely styled. 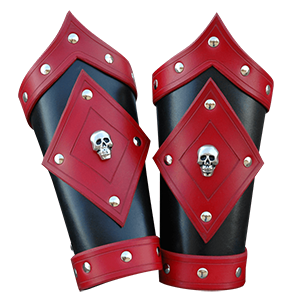 Leather leg armor can consist of many pieces, and that is why we carry such a wide variety, ensuring that every warrior can be just as protected as they want, while still featuring the exact look and style that they wish. We offer full leg armor that virtually provides the utmost protection you could possibly want for your legs, as well as a great selection of greaves that provide protection to your lower legs and calves, ensuring that you are protected yet still light and mobile. 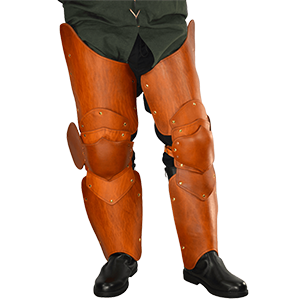 We also have a selection of cuisse, thigh armor, and tassets, for providing that added touch of protection to your upper legs, along with the rarely seen sabatons that will offer great protection to your feet. Much of our leg armor is crafted from either 13-15 oz armor grade leather or from lighter 7-8 oz leather that is perfect for use in LARP battles. Some of it is also custom-made, which means that it will fit your measurements and provide a quality fit and a high degree of protection, just like good medieval leg armor should! What else could reenactors want, other than a good set of leather leg armor from Dark Knight Armoury? What is that? Low costs? We have that too, and that is why we are one of the best leather armorers around! 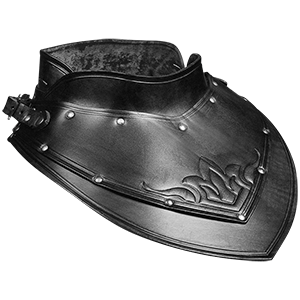 A leather gorget is a great piece of authentic medieval armor, as well as a fantastic protection that will help ward off blows that might slip through to your neck or collar. But more importantly then that, the gorgets at Dark Knight Armoury are also a great piece to include in any armor set, for reasons of both protection and versatility. Now, if that word strikes a chord in you, you might be wondering how a gorget can be versatile. Well, we will tell you. Above and beyond providing additional protection, a gorget can also act as a harness, as many feature added buckles and bands that are perfect for providing support to a variety of different armor pieces. This means that some gorgets give you the option of wearing pauldrons. Others possess unique features, like full neck protection or bevors that work wonders for keeping you, your neck, and your shoulder even safer from harm than before. Many of our gorgets are crafted from 13-15 oz leather, which meets SCA standards for leather armor, making it a solid and sturdy piece that is every bit as protective as it sounds. To put on a gorget, you typically put it on backwards, with the lacing or buckles in the front, and turn it around once it is secure. Pair one of our simple leather gorgets with any suit of leather armor to provide that added bit of protection that every warrior should have, or wear one of Dark Knight Armourys more visually complex and stylized fantasy gorgets to help create a style and a look that is both highly protective and totally impressive. Sometimes, putting together a full suit of armor can be a hassle and a headache, one that you just do not need. Luckily, when you visit our armor packages section, you will find that Dark Knight Armoury has done all the work for you, as we offer a number of great package deals that feature a number of quality pieces of leather armor. And there is quite a variety of armor to be found here, ranging from smaller sets that include a few pieces of leather armor to full suits of leather armor that will keep you protected from head to toe! Some of our sets of leather armor feature a design inspired by fantasy, which makes them perfect for creating all manner of stylish and stunning looks, ranging from barbarians to Vikings to knights and more. Others lean towards realism, recreating traditional pieces of medieval leather armor that are as functional as they are stylish. All of the leather armor found here is made in a variety of different weights, ranging from 7-8 ounce leather to 13-15 ounce leather and some that fall in-between. Each suit of leather armor or leather armor sets will list their specified leather weights. Virtually all of our leather armor sets are perfect for use as either complete costumes or as costume pieces, or as LARP armor and Renaissance fair wear, while some possess the strength to be functional leather armor that any warrior would gladly wear into an actual reenactment battles and more. And the best part is that you are guaranteed to save when you buy a leather armor package, because the package deal is definitely cheaper than buying each piece individually! So take the hassle out of building your look or suit of leather armor, and instead visit Dark Knight Armoury. 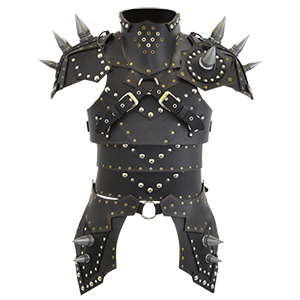 Browse our armor packages section and pick up a set of leather armor that suits your needs and tastes, and when it arrives, you can put all your energy into really enjoying the killer leather gear that you now own.